Before I start rambling about festivals, I'd just like to say a huge thank you to everybody who has followed my blog so far! Yesterday, I reached 100 followers and I can't believe how wonderful everyone in the blogging community has been. I've talked to some lovely people, discovered so many amazing blogs to follow and I'm enjoying blogging more than I could have ever imagined. So, if you're reading this thank you so much and if I could I'd hug each and every one of you! 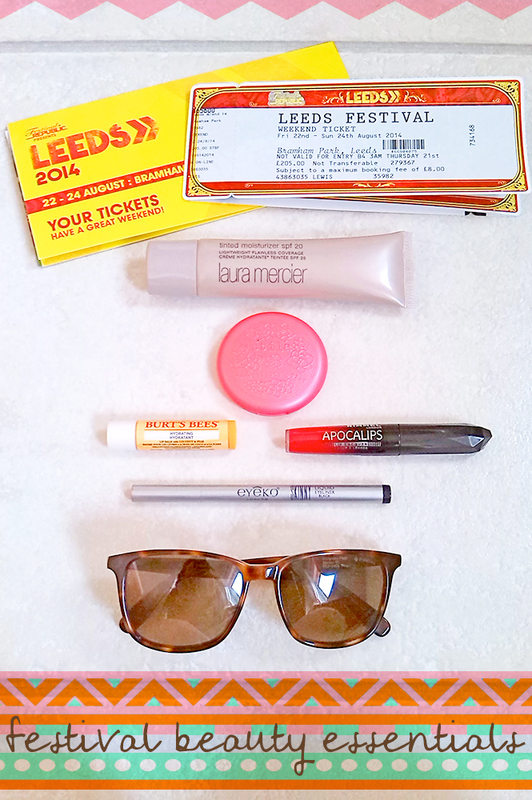 I know festival season is almost over but Reading & Leeds begins this Friday and, in a way of controlling my excitement, I thought I'd write a post on my festival beauty essentials! Of course I'll also be taking dry shampoo and a ridiculous amount of baby wipes with me but the items I've decided to feature in this post are the things that help me feel a little bit more glamorous and put together as I trawl through the mud in my pac-a-mac and eat an unsightly amount of fried food. We can't all have perfect, blemish free skin but trying to apply a full coverage foundation with your make-up brushes in a field isn't going to be easy. I prefer to use something I can apply with my hands and I'll be taking the Laura Mercier Tinted Moisturizer with me this weekend! It provides light coverage and it adds a little bit of colour and a healthy, dewy glow to my skin. It's easy to blend in and it also has SPF 20 so your face will be protected throughout the day. My lips dry out in the mildest of weather so wherever I'm going I have bring a lip balm with me. I'm a huge fan of the Burt's Bees lip balms and my particular favourite right now is the Hydrating Lip Balm with coconut and pear. It contains coconut oil and shea butter which helps to soften my lips, especially in dry or cold and windy weather, and it also smells amazing! Lipstick always makes me feel stylish and it's one of the easiest ways to brighten up your make-up at a festival. I'll be taking one of my all-time favourite red lipsticks, Rimmel Apocalips in Big Bang, which has amazing staying power and acts as a lipstick, stain and gloss all at once! Even after the gloss has faded you don't need to reapply as the colour lasts all day. Products that have multiple uses are perfect for festivals. The less you need to carry, the better and Stila's Convertible Colour Dual Lip and Cheek Cream is a brilliant, versatile product. I have Petunia, a beautiful, bright pink shade, and all I have to do is dab a little onto my cheeks and lips and I instantly look more awake. The compact is small and includes a little mirror which is really handy for touch-ups! This might be a controversial choice but for me nothing else makes me feel put together like liquid eyeliner. If I apply eyeliner one handed it looks like a toddler has drawn all over my face so I'll most likely be annoying my boyfriend in the morning and making him hold up my mirror. This might require two people but I simply had to include it because I'm determined to look as cool as Alexa Chung this weekend. My eyeliner of choice is the Eyeko Skinny Liquid Liner as the felt-tip like nib helps even the wobbliest of hands gain control. If all else fails, and your under-eye circles are beyond saving, ditch the concealer and throw on a pair of sunglasses! You'll look stylish and your eyes will be protected from the sun (and mysterious liquids that are thrown around crowds in plastic cups...Yuck!) My favourite sunglasses of the moment are the wayfarer style tortoise shell glasses from Polaroid! Have you been to any festivals this summer? What are your festival essentials?